Prevent eviction as a result of rent non-payment, allowing the applicant and his/her household to remain in their home. What do you need to know to apply for aid? In these sections, you can find out the eligibility requirements and the steps you need to follow to apply for this aid, which can be requested at any time from the Housing Offices of Barcelona. Persons residing in Catalonia, whose household income does not exceed the limits established in the requirements, and who have generated a rent debt and are at risk of residential social exclusion. Monthly household income cannot exceed the amounts indicated in the table. The home must be the habitual and permanent residence of the applicant, and must constitute his/her domicile according to the municipal register. This same criterion applies to the relationship between the property owner and the tenant, when the former is a legal entity, with respect to its members and participants. The urgency and the special need of the household must be proven with the contribution of a socio-economic report from Social Services of primary or specialised care, which proposes the granting of the aid for these reasons. The applicant must hold a rental contract, an assignment of use or, exceptionally, a sublet contract as regulated in article 8.2 of Law 29/1994, of 24 November on urban rentals, or the right of subrogation over the home, in accordance with articles 15 and 16 of Law 29/1994 and other concordant provisions. The applicant must have generated a rent debt due to unforeseen and unexpected circumstances, duly justified. The applicant must have paid the rent for a minimum period of three months, counted from the signing of the rental contract until the submission date of the application for the aid. 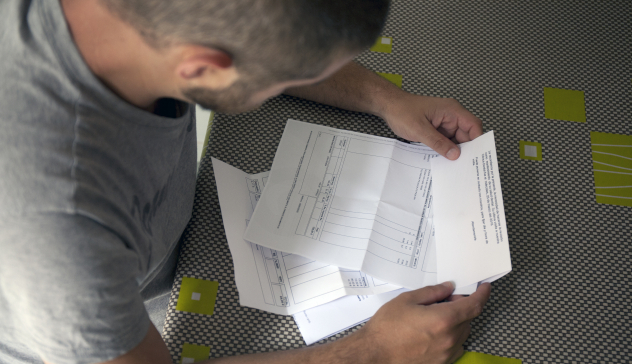 The date of the first unpaid rent receipt cannot be from longer than 12 months ago, counted from the submission date of the application, except in cases in which an eviction process has begun. The amount of aid requested must guarantee the settlement of the existing debt and the applicant must be in a position to continue paying the rent from the moment the application is submitted. This condition is considered to be met when the monthly household income is at least equal to the monthly rent payment. If, while processing the application, debt continues to accumulate, social services can propose an increase of the requested amount, justifying this request through a new social report. The proposed increase will be assessed and, if appropriate, may be resolved favourably, always within the limits of the maximum amounts established. Exceptionally, when the accumulated debt exceeds the established limits, and when documented evidence is provided to prove that an agreement has been reached between the applicant and the property owner or manager regarding the payment of the debt, the request may be evaluated and resolved favourably. When the amount of aid granted is less than the maximum amount established, additional aid may be newly granted up to this maximum amount, provided that at least three monthly rent payments are made between the date of the last monthly payment of the aid initially granted and the submission date of the new application, both included. Monthly rent cannot exceed 750 euros. At the time when the application is resolved, 12 or more months must remain in the term of the rental contract, and if this is not the case, the property owner must guarantee in writing the contract renewal. Neither the applicant nor any member of the household can own a home unless they do not have the right to its use and enjoyment. Persons who have received the maximum amount of the aid cannot request aid of an urgent and special nature for the payment of the rent until a minimum of one year has passed between the date of application resolution and the new application. The aid cannot be received by households in which any member is related by marriage or other similar stable relationship, by consanguinity, adoption or affinity, up to the second degree, with the property owner or manager. People living in a home managed by the Housing Agency of Catalonia are not eligible for this aid, either directly or through other public administrations or non-profit organisations; nor are those who have been offered access to a home from the social housing pool and have not accepted it, except for justified reasons. The beneficiaries of the complementary aid for the payment of rent debts subject to a legal eviction process may be granted complementary aid to continue payment of the rent, provided that at least 12 months remain in the term of the rental contract at the time that the resolution to grant the supplementary aid has been issued. Otherwise, the property owner or manager must guarantee in writing the contract renewal. The beneficiaries of the complementary aid for continued payment of rent must be paying the rent by bank transfer, direct debit, account deposit or receipt issued by the property manager at the time of the resolution to grant the aid. Application form for aid of special urgency . Certificate of cohabitation proving that the home is the habitual residence of all people in the household. In case of not having an income accredited with official documentation, a sworn statement of income by the payer. Original and photocopy or certified photocopy of the rental contract in the name of the applicant. In the event that the person applying for the aid is the spouse of the contract holder, or has been transferred the rental contract, or is in a situation of separation or divorce, the right of use of the home must be proven by providing the subrogation, judicial sentence or, if applicable, separation or divorce agreement. With the aid, the entire debt must be settled; however, if an agreement is reached with the property owner to split the debt amount for the assessment of the granting of the aid, the aforementioned agreement must be presented. Standardised certificate from the property owner or manager indicating the debt details and the months to which the debt corresponds. If an eviction process has begun: certified photocopies of all available legal documentation of the eviction case, proof of having requested a lawyer ex officio or the appointment thereof, and a commitment document signed by the property owner. Receipts for rent paid must be presented, in accordance with regulations, in order to collect the aid. Standardised bank data form, in the name of the applicant, with the bank account data required in order to make the payment, duly stamped by the financial entity. Aid for the payment of rent debts: the amount is determined according to the accredited debt. The maximum limit is 3,000 euros and can be granted for a maximum period of 12 months. Supplementary aid for rent payment in case of legal proceedings: The amount of the aid is set at 60% of the annual rent of the home, with a maximum limit of 2,400 euros per home. This aid can only be granted once and for a maximum period of 12 months. 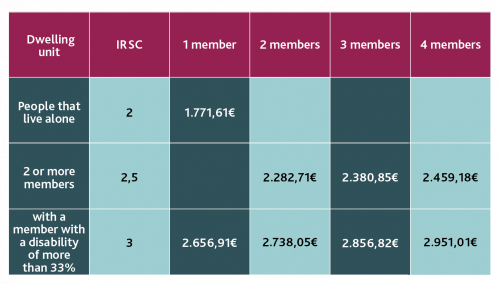 These benefits are compatible with aid from other public administrations for the same purpose, provided that the sum of the different benefits granted does not exceed the amount of 3,000 euros and that they have not been obtained for the same year and for the same monthly payments.